Because of distorted sales figures, Ford's Escape cross-over SUV, not the Focus small car, tops the list for most popular 'clunker' buy. 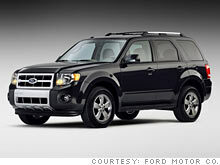 According the government, the Ford Escape was the seventh most popular vehicle bought under Cash for Clunkers. But that was just the two-wheel-drive gasoline-powered Escape. There are five other versions that were counted separately. The most purchased vehicles under Cash for Clunkers if 2WD and 4WD versions are included. NEW YORK (CNNMoney.com) -- What are people trading their clunkers in for? It depends on who you ask. Sales of truck models would tend to be heavily diluted using the government's method because practically each version counts as a different vehicle. The difference in tallying methods would not affect the overall totals of trucks, as opposed to cars purchased under the program, only the sales rankings of individual models. Sales of GM's Silverado truck, under the government's counting method, were divided among five different versions. So were the Ford F-150s. If the different versions of these trucks were considered the same vehicle, as auto sales are normally reported, sales of these trucks would look much heftier. In the Cash for Clunkers program, trucks are actually subject to lower fuel economy requirements than cars, so it surprised many analysts that trucks weren't more popular. Edmunds.com's "Top Ten Clunker Buys" list is based on transaction data collected directly from dealers. NHTSA, the agency responsible for running Cash for Clunkers, was not immediately able to respond to a request for official Clunker sales tallies of several vehicles, including all their variations. When presented with Edmund's analysis, the agency didn't dispute that the way in which it counted the vehicles would tend to reduce the totals of vehicles with many variations.